Rudy running the beach. He wasn't running away but a less-responsive dog would have been gone had it accidentally gotten loose. Melody Grieves. We have visions of our Greyhounds following us around while we move from place to place, while working in our gardens, walking on the beach, or hiking in the woods. These are lovely fantasies that could be reality if the dog were a Lab or a Golden. It ain’t gonna happen if your loyal companion is a Greyhound – not unless you’re in a fenced area or your hound’s leash is securely in your hand. On the other hand, here are a few examples of true, not-so-amusing scenarios that occur repeatedly; a couple of these events have happened to our own dogs over the years. Sometimes these loose dogs return home; sometime they don’t – not alive anyway. Even worse, some are never seen again. The list of escape scenarios is endless but not to worry. Recognizing that “stuff happens” to even the most careful Greyhound owner, taking a few simple precautions will reduce the possibility of your Greyhound escaping to almost zero. The most common escape route is a door, gate, or window that’s slightly opened. Most escapes are made by newly-retired foster or recently-adopted Greyhounds. All these new retirees know is that an open door, window or gate is much the same as the starting gate at the track; they may think that opening means RUN! Fresh off-the-track Greyhounds know nothing about cars, highways, traffic, or even how to get back home if they are lucky enough to be unharmed. To them, “home” is the track kennel. Disoriented Greyhounds whose adoptive owners may not even know their kennel names run full speed to nowhere. Workmen need to be as dog-savvy as you are. Many dogs escape while workers go back and forth from the house to their trucks or to their “workshop” in the garage. If they can’t be trusted to be as paranoid about open doors are you are, find some workmen who are. 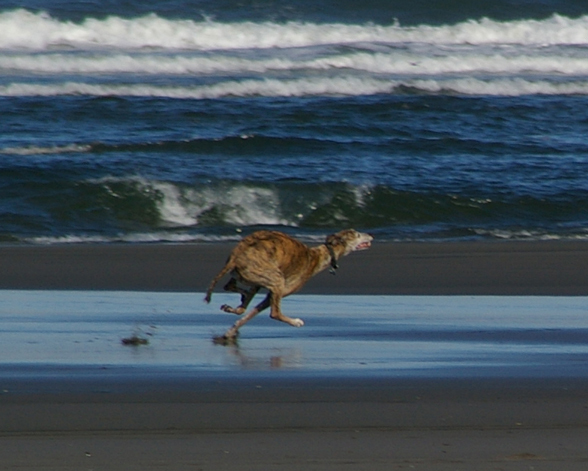 It sure sounds like Greyhounds aren’t much fun if one has to be so careful about them getting loose. But really, once the preliminary Greyhound escape-proofing is done and you’ve become accustomed to watching for open doors and gates and checking for properly fitted collars, you won’t even think about doing it; it will just become second nature to you. By taking a few precautions your Greyhound is highly unlikely to be hurt or lost and you won’t ever need to be separated from your fast friend. Last but not least, is a suggestion from one reader and that is to train your Greyhound to not bolt out the door. Greyhounds learn the stay, wait, come and other commands as easily as they learn anything else. Excellent additional point, Jennifer. It is so excellent I added that to the very end of the article! Thank you for the comment. But most of all, please train your greyhounds. They can learn to come when called, not to bolt through doors, and to walk nice on a leash. Be proactive… it shouldn’t be only about defense tactics.